This book is what I call the Westmoreland Diary. 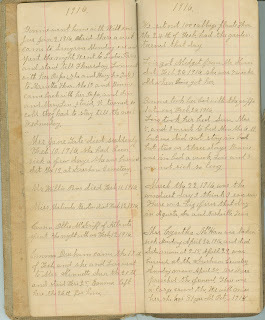 It is a diary or journal of the community and the Westmoreland family. The weather is recorded, who bought what calf from whom, who married, who died, who had an accident. It was kept by a member of the Westmoreland family who, I think self-appointed herself to keep journalistic records of the area.. By some of the mournful outlooks I think it was written by Minnie Westmoreland, wife of Ben Westmoreland and mother of Bonnie and Gwen Westmoreland. I am interested in the contents, not only for the day to day living described, but there are bits about my Hunter family and Anna’s Prance family. They all lived in the same community, which centered mostly around Noonday Baptist Church. The Westmoreland lived at the corner of Bells Ferry and Booth Road. At the time of the writings, from the early 1900s to the middle 1900s that particular area was a small community, everybody knew one another and many times related to each other. My great grandfather William Hunter is mentioned several times here and there and also some of his sons, but most of all, William’s son Arthur Hunter is mentioned many times. Why? Because he married Gwen Westmoreland. Arthur and Gwen Westmoreland Hunter moved to Cordele, Georgia, not long after they were married, but apparently, kept the road in between both points hot – or at least dust flying. Also, the members of the Prance and Wright family are mentioned here and there – which would be Anna’s kinfolks. Of course the Hunters, Prances, and Wrights had no idea they would be in-laws, after they were dead. Only by chance did I end up with these pages copied. My mother-in-law asked me to scan them for a church project on the history of Noonday Church that she is doing. So, ahem!, I ended up with a copy of each page. There are 70 pages. I have so far transcribed 7 pages, which is 10% of the entire volume, so I thought I would show those now, and possibly show increments as I transcribe more pages. It may take a while to get all of them finished… I juggle several projects all the time. 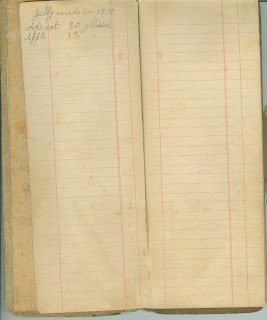 A few mechanics of it: The diary was recorded on an old ledger book. Well, I guess when she started off it wasn’t old, but it increased in age the same as its author. At first, the writing is perk… near the end the writings appear to be shaky. Also some of the dates are sometimes confusing, in the wrong place in the book, not in chronological order… but those are few and rare. 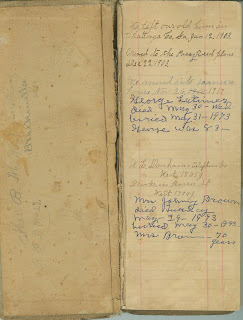 We left our old home in Chattooga Co., Ga., Jan 12, 1903. Moved to the Posey Reed place Dec 22, 1903. We moved into Jarmer’s house November 26 1917. George Latimer died May 30, Wed. Buried May 31, 1973. W.L. Durham telephone number West 1865j. Brooks on Russer Street 1704j. Mrs. Johnny Brown died Tuesday, May 29, 1973. Buried May 30, 1973. Mrs. Brown was 70 years old. Jelly made in 1910. Apricot 20 glasses. Harry Latimer died Feb 23 1915, and Jim Role died Oct 16, 1915. Two brothers died in less than eight months. Both had consumption. Old Mr. Russell died Oct 23 1915. Buried at Dawson Cemetery. Anna May Latimer died Jan 13, 1917. Jack Poor was killed in Birmingham, Ala., Oct 16, 1915. He and three others were killed by an explosion. Jack was buried at Bascomb (Methodist Church) Monday. John and Len Booth’s son Gland died Nov 6 1915. Arthur Hunter (William Hunter’s son) left Woodstock Sunday, Oct. 31, 1915 and went to Cordele, Ga. Gwen and the children came down here Nov 4 and staid until Dec. 10. They left here this morn and was going by Mr. Prances’ (Anna’s relative) then on by the boys. 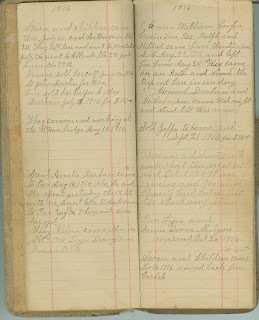 Ben and Olin were going on to Marietta and carry cotton. James and Luella are going on to Atlanta with Gwen. They will go to Will’s tonight and to Cordele tomorrow. We bought our new stove Dec 18, 1915. Mr. Mack Dobbs dropped dead at his home at Blackwell Nov. 29, 1915, was buried at Dawson Cemetery Nov 31, 1915. Cousin George Griffith died last week in Nov. 1915. George Coggins’ barn was burned Saturday night Dec. 4, 1915, and two other barns and two dwellings burned Sunday night Dec 5, 1915. Pearl Prance died Thursday night at 8 o’clock Dec 9, 1915. Bro. Dyer preached her funeral at their home at 2 o’clock and buried at the grave yard at 4 o’clock. 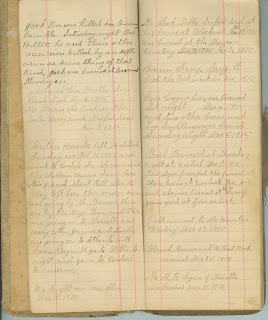 Robert moved to Mr. Hunter’s (William Hunter) Friday, Dec 17, 1915. Blanch Beavers and Willard Rich was married Dec 25, 1915. Mr. M.R. Lyons of Marietta was buried January 31, 1916. Bonnie went home with Will and Lou Jan 2 1916. Staid there a week came to Smyrna Monday eve and spent the night with Ludie Paris and staid til Thursday. Lois went with her papa (she and Mary Lou Tate) to Marietta Thurs the 13th and Bonnie came up with her papa, Lois, and Mary Lou staid. It turned so cold they had to stay until the next Wednesday. Mrs. Jane Tate died suddenly Feb 10, 1916. She had been sick a few days. She was buried Sat the 12, at the Gresham Cemetery. Mr. Willis Pear died Feb 11, 1916. Miss Malinda Newton died Feb 12, 1916. Emma Durham came the 17th of Feb and she and Lois went to Mrs. Stennent’s Sun the 20th and staid there ????. Emma left here the 26th for home. We sat out 100 cabbage plants Thursday the 24th of Feb. We had the garden turned that day. Lois got Midget from Mr. ?, Sat Feb 26, 1916. She was 7 weeks old when Lois got her. Bonnie took her bed with the griffe (? ), Sat, Feb 26, 1916. Lois took her bed Sun Mar the 5th and I went bed Mon the 6th but did not stay in bed but for 2 or 3 days. Bonnie was in bed a week. Lois and I were not sick as long. March the 22nd 1916 was the windiest I think I ever saw, There was big fires that day in Augusta, Ga., and Nashville, Tenn.
Mrs. Cynthia McHan was taken sick Monday Apr 24, 1916 and died Sat morn at 2:15 Apr 29. Was buried at the Gresham Cemetery Sunday morn Apr 30. Brother Dyer preached the funeral. There was a large crowd there. We will miss her. She was 81 years old Oct 1915. Gwen and children came July 14 and Arthur came the 20th. They left here and went to Wooster (?) July 26, went to Atlanta the 28, got home the 29th. Bonnie sold her calf July 14 1915, to Mr. Austin for $100. 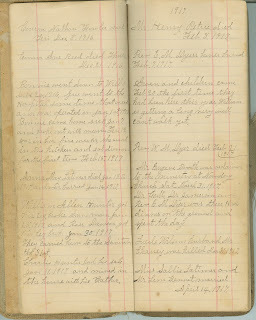 Lois sold her heifer to Max Durham July 18, 1916, for $15. They commenced working on the McHan Bridge Aug 16, 1916. Aunt Amelia Durham came to Pa’s on Aug 16, 1916. She, Pa, and Ma spent yesterday the 18th with Aunt Ella came to Pa’s ???. I have not seen her yet. Mary Nelson came October the 9 and Lizzy D????? October 16. Cousin William Cooper, Cousin Laura, Rex, Ralph, and Mildred came from Fountain Barn (? ), S.C., Aug 22, 1916, and made the trip in one day. Howard Durham and Mr. Culverson came Wednesday night and staid here til morn. There was a ???? earth quake shock this ??? 4:30 o’clock. It was raining and the wind blowing hard but we felt the shock very plain. Ren Ligen and Annie Downs Kilgore married Oct 24, 1916. Gwen and children came Nov 16, 1916 – Moved back from Cordele. Cousin Nathan Fowler died Fri Dec. 8, 1916. Cousin Sue Reed died Thurs Dec. 21, 1916. Bonnie went down to Willis Dec 24, 1916. She went to the hospital sometime that week and was operated on Jan 1st, 1917. Bonnie came home sick Jan 7, and broke out with measles. She was in bed five weeks. She went into the kitchen and ate dinner for the first time Feb 15, 1917. Anna May Latimer died Jan 13th, 1917. William Allen Hunter got his leg broke Sun morn, Jan 28, 1917. They carried him to the sanitarium the 31st. Charlie Hunter had his sale Jan 31, 1917, and moved in with his father. Mr. Henry Petree died Feb 8, 1917. Gwen and children came Feb 20 the first time they have been here this year. William is getting along very well, he can’t walk yet. Mr. Eugene Booth was ordained to the ministry at Noonday Church Sat., March 31, 1917. Dr. ??? ?, Dr. Jamerson, and Rev E.M.. Dyer was there had dinner on the ground and spent the day. Lucile Wilson’s husband Mr. Chaney was killed Mar 31, 1917. Miss Sallie Latimer and Mr. Lern Bennett married Apr 14, 1917. I think 'griffe' may be grippe, which we call flu (influenza). It's already time to be thinking about where we'll get our flu shots this year. 'griffe' is possibly flu eh? Thanks, that is good to know. Yep, that season is creeping up. Last year I wanted in line at a Walgreen's Pharmacy to get my flu shot, the year before I went to the county health office. I wish that some of my family kept a journal like that. Where did the Noonday cburch get it's name? I haven't seen it in print but I heard verbally, back before automobiles existed if you left downtown Marietta in the morning you would pass a certain creek at Noon. So, the name of the creek that flows behind the church and in front of my mother-in-laws house is Noonday Creek. And the church is named either for the creek or the the time of day passing - I'm not sure which. i covet your book! steve has some interesting artifacts from his family history, but nothing like that! Well, I don't really "have it". The original is in the hands of historian of Noonday Church, which is my mother-in-law. I just have a copy of each page. This diary is a real treasure. I live in Noonday, off Hawkins Store Rd for about ten years now and have been trying all that time to discover and understand what existed here in this section of Cobb County so far as the original families, their lands, homes and farms and histories, where the present street names came from, like Prance, Jamerson, Fowler, Hawkins Store..etc. 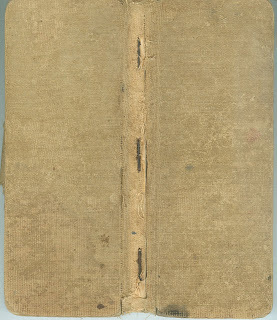 This journal is simply full of that information. I do hope that you will be able to get it transcribed completely or at least possibly you can share the scans of the remaining pages. Thank you. If you search this blog I think you will find more of the dairy entries. In the top left there is a blank to put in the name of something to search for this blog - in this case it would be Westmoreland. Try it, I think you may find more. Someday there possibly the remainder pages might be on this blog. 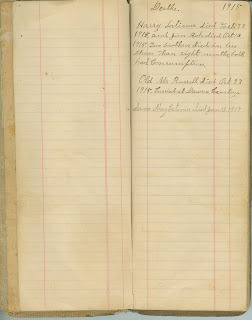 I also have in my possession a mill owner ledger who who owned him how much in the same community. Which has additional interesting information that I might get to some day. found them! thanks and looking for more pages soon and do keep up the recollections about your growing up around here. That one about tossing the empty beer cans in the Westmoreland's property was priceless. (An Unspoken Gentlemen's Agreement) We even drove by the scene of the crime today just to see that spot. By the way, you mentioned Prance as one of the names you see in the area. I married into the Prance family.